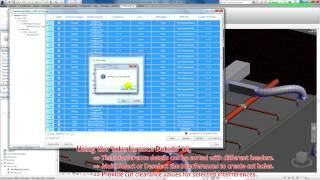 This software tool is an Add-in for Autodesk® Revit®. The purpose of this tool is to cut holes in host elements like Wall, Floor, and Ceilings where they interfere with the MEP Elements like Duct, Pipe, Cable Trays and Conduits. This is the Trial edition of this App. To get the full edition of this App, please contact the publisher. Please check this video to better understand this tool. The interferences between the Host elements and the MEP elements are displayed in a user-friendly screen. The cut holes created for the MEP elements which are closer to each other can be merged to form one single cut hole. The automatic 3D sectioning is possible to view the selected elements. Detailed log messages at the end of each cut process can be saved in a text format. Easy and efficient ways available to create cut holes in the linked Revit projects. Provisions are available to provide clearance value to each cut hole. The clearance values can be modified after inserting cuts. Both the rectangular and circular holes can be created based on the user’s need. Only 20 Cut Holes can be merged in one execution. The Link Projects will not be taken into account. Last Log Report can only be viewed 20 times per Revit session. The full edition of this App doesn’t have all the above limitations. Autodesk® Revit® 2016 to 2019 versions are supported.